Join the LEGO® City deep-sea explorers on their search for lost treasure with the Deep Sea Starter Set! The diver has spotted a mysterious chest on the seabed and needs your help to free it from the seaweed. Take control of the remote sub and use its powerful robotic arms to release the chest and reveal the secret treasures hidden inside. But watch out for the snappy shark lurking in the dark water! 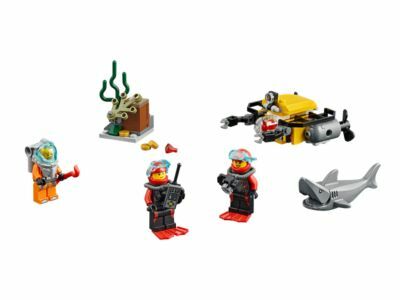 Includes 3 minifigures: a deep-sea diver and 2 scuba divers. The Deep Sea Starter Set (60091) Lego set is no longer directly available from the sites below. However, 3rd party partners of these sites might still have the set available. Alternate description Enjoy underwater adventures with the Deep Sea Starter Set, featuring a remote sub, shark, chest, coins, camera, seaweed and 3 minifigures.